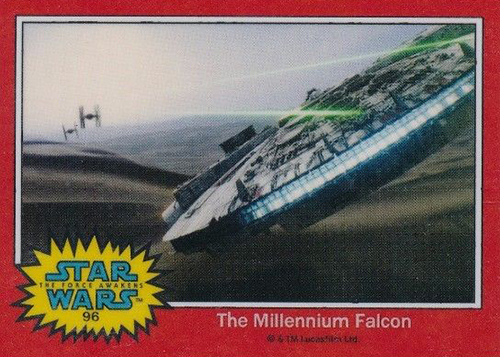 Star Wars: The Force Awakens isn’t sneaking up on anyone — except when it comes to trading cards. 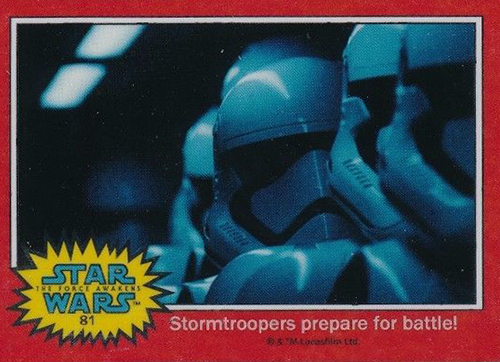 First was a group of four Heritage-style promo cards in 2015 Topps Star Wars Illustrated: Empire Strikes Back. Surprise! More unannounced Star Wars: The Force Awakens promo cards have surfaced in both Chrome Perspectives 2 and 3D Widevision: Revenge of the Sith. 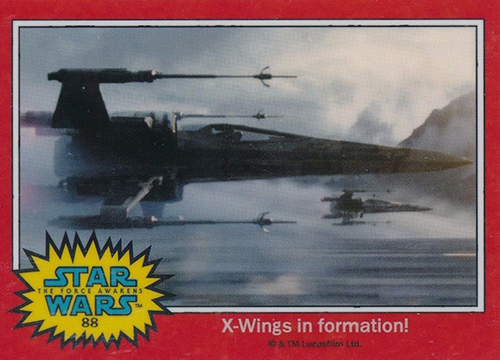 For those that have been following the buildup to Episode VII, the cards themselves are going to look familiar. They’re actual versions of the images Entertainment Weekly released to announce the names of several characters. The images come from the film’s first trailer. 2015 Topps Star Wars Chrome Perspectives 2 has eight cards, half of which has two different versions. The Force Awakens Chrome promo cards appear to be inserted one per box. Four cards also have Glossy versions. These land one per case. 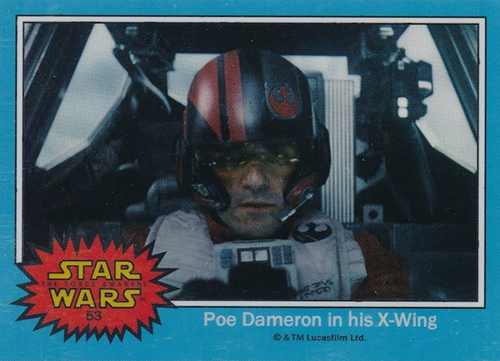 The other four Glossy cards are randomly inserted in 2015 Topps Star Wars Widevision 3D: Revenge of the Sith. It’s the card stock that sets the latest Force Awakens cards apart from the ones that are already out there. Star Wars Illustrated: ESB and another four cards included in a special Lando comic given away at the 2015 San Diego Comic-Con use card stock that is common with Topps Heritage sets. The basic design of all the cards come from the most iconic Star Wars cards ever — the original 1977 sets that launched the franchise. 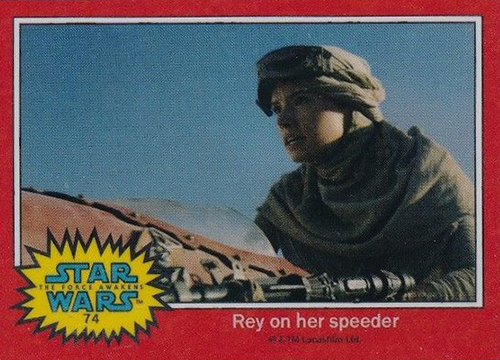 Topps has no shortage of Star Wars: The Force Awakens cards planned. First up is Journey to the Force Awakens, a release that covers the entire saga. Then in December, it’s The Force Awakens Series 1, which is slated to focus on the movie’s characters and main story elements. Although not officially announced, this looks to set up a second series in 2016 that delves deeper into the movie, special effects and spoilers. Here’s a full list of all the Topps Star Wars: The Force Awakens promos released so far and where they’re found. Cards have Heritage-style card stock. 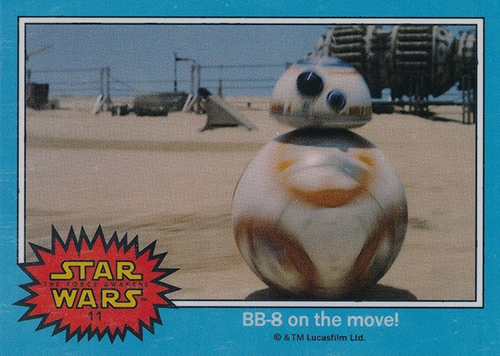 11 BB-8 on the move! 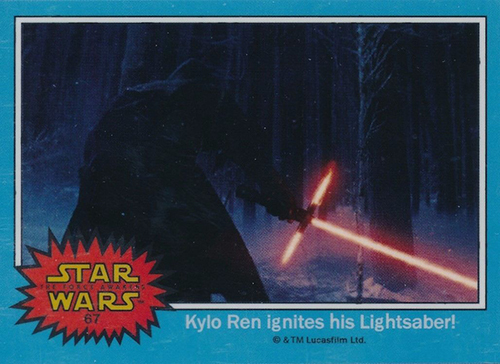 67 Kylo Ren ignites his Lightsaber! 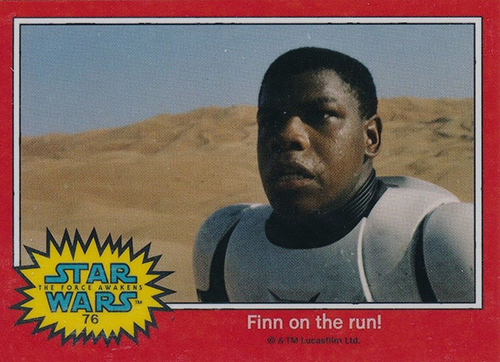 76 Finn on the run! 81 Stormtroopers prepare for battle!